How to find the best babysitter for your family when you can’t take your baby or child with you. Finding a babysitter can be a serious challenge. How do you find the right person to entrust with your children when you’re away? Whether you need full-time or part-time care or you’re just desperately seeking a date night out, most parents in Champaign-Urbana will find themselves in this predicament at some point. Pinpoint your childcare needs. Do you want someone for occasional weekends? Do you need week nights? Over nights? After school? Do you need a full-time or part-time nanny? Be honest with yourself about expectations. Want your sitter to empty the dishwasher while Junior naps? Looking for someone who will read to your baby and play with her, too? Then be ready to set that expectation with the person you will have in your home. One place to start when looking for a babysitter in Champaign-Urbana: The Child Care Resource Service located in Urbana. CCRS is a program of the Department of Human and Community Development at the U of I.
CCRS has a booklet that includes contact information for available students willing to do childcare in the child’s home. Parents should call 217-333-3252 and go to option three or stop by the office, located at 905 S. Goodwin Ave., 314 Bevier Hall, to obtain contact information for students. You might also consider posting an ad on Craigslist. The site has gotten a bad rap over the years but if you follow your instincts and follow up with reference checks, you could find the perfect fit for your family. Many of our area families also use Nextdoor.com to find local babysitters. National websites like Sittercity.com and Care.com will allow you to peruse a list of potential caretakers for your children that includes information about their experience and references. The downside is it will cost you money to buy a membership. Make your need for a sitter Facebook official and post an ad on your own social media page. I got several responses after I posted a plea for help. Thanks to that post, I ended up getting a couple of great sitters we still use today. Another great resource online: The Champaign-Urbana Childcare Connection Facebook Page, which serves as a matchmaker for local sitters – from high school kids to college students to grownups. Don’t forget to look offline as well. Ask around your (offline) networks. If you belong to a church/synagogue/mosque, perhaps there is a youth group there with kids who babysit. Or maybe an older member of the church — perhaps his/her grandchildren live far away — is interested. Were you in a sorority? Ask your sorority if you can post a flyer or info at your house on the University of Illinois campus. Same thing with campus-based faith organizations. Many of them offer bulletin boards where you can post a job. Ask your neighbors – maybe they know of young adults in the neighborhood who babysit. If your child is in daycare or preschool, ask the school what its policy is regarding teachers babysitting — go ahead and ask your child’s favorite teachers if they babysit. Ask anyone you trust if they know of any good caregivers who may fit your parameters. Remember when we talked about expectations? This is when they come into play. Include what you will be paying, and whether not it is negotiable. If you say it’s negotiable, expect negotiation. Being honest and forthcoming from the get-go will prevent headaches later. So you have a few candidates. I prefer to do first interviews in a public place. If they deserve a second interview, then I will invite them over to my home for the “child test” to see how they will interact with my kids. Ask the basics: experience, references, safety training. Set up a scenario and ask the sitter how she/he would handle it. If you have specific tasks you need from a sitter/nanny, be direct and ask up front about experience with such tasks. Also, ask them what they WON’T do. The answer might surprise you. Here is a decent list of interview questions; prepare yourself in advance of the interview. There are many ways to check out a babysitter, especially if you don’t want to spend the outrageous $555 fee I saw being advertised online for a background check. Get a criminal background check from the State of Illinois for only $16, via the Illinois State Police. However, this is limited to just this state. Instructions are linked here. Illinois DCFS will also allow you to submit a request for a background search of the “Child Abuse and Neglect Tracking System (CANTS)” system, with consent of the job applicant. More information here. Don’t forget to check references. It’s amazing how many people don’t do it. If possible, make sure that the first time your sitter is alone with your children, you are in the house. Yes, I said that you should be in the house. Stay out of their hair, but stay close enough so you can observe how he/she interacts with your kids. Break them in easy and make them feel at home. If one sitter doesn’t work out, don’t be afraid to start again. Chemistry is a funny thing, and sometimes it takes a couple tries to find The Right One. 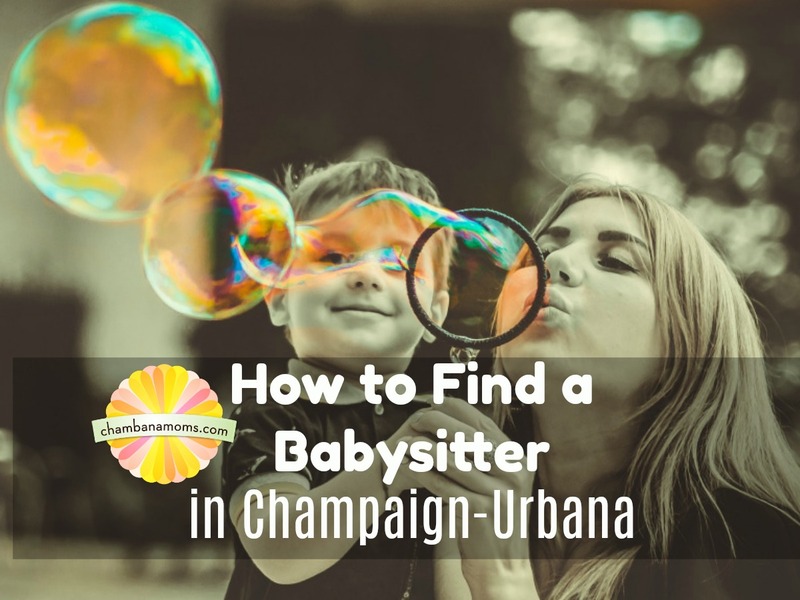 How did you find your babysitter in Champaign-Urbana and Beyond? Share your tips in the comments below.